Oil prices ticked higher Wednesday as OPEC said the world would consume more crude in 2010 than previously expected, and China said its economy improved. Benchmark crude for December delivery added 23 cents to settle at $79.28 a barrel on the New York Mercantile Exchange. In London, Brent crude for December delivery rose 45 cents to settle at $77.95 on the ICE Futures exchange. The Organization of Petroleum Exporting Countries revised its previous estimates for global oil demand growth to 750,000 barrels per day, up 50,000 barrels a day from last month's estimate. But OPEC also warned that higher oil prices "could dampen world oil demand in the coming year." Meanwhile, China said industrial output and retail sales rose sharply, and exports fell by the smallest amount in 10 months. China's economy, the third largest in the world, is expected to draw heavily from global oil supplies next year and help drive prices higher. 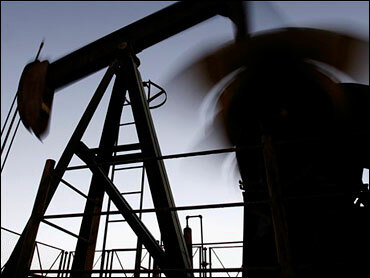 The reports pushed oil higher despite indications that crude supplies in the U.S. are growing. Late Tuesday, a survey from the American Petroleum Institute said U.S. oil stockpiles grew last week by 1.2 million barrels, more than analysts expected. The Energy Information Administration is scheduled to release its weekly supply data on Thursday. For the past several months, the weak dollar has helped keep oil prices high despite a slump in American consumption. Crude prices, which are based on U.S. currency, tend to rise when the dollar weakens and makes oil cheaper for investors holding stronger money like the euro. The dollar fell to new 15-month lows in the morning, but it rebounded by midday. At the pump, oil prices fell by less than a penny overnight to a new national average of $2.654 a gallon, according to AAA, Wright Express and Oil Price Information Service. A gallon of regular unleaded is 17.2 cents more expensive than it was last month and 43.4 cents more expensive than a year ago. In other Nymex trading, heating oil rose by less than a penny to settle at $2.0558 a gallon. Gasoline for December delivery added 1.53 cents to settle at $1.9927 a gallon. Natural gas for December delivery increased by 3.6 cents to settle at $4.503 per 1,000 cubic feet.